MICHAEL BELLARDO and MARTIN BUGLISI vs. JOHN D. BROCK, et al, as they are members of the NANTUCKET PLANNING BOARD; and KENNETH I. PARKER, as he is Trustee of Trustee [Note 1] of UNION STREET REALTY TRUST. MISC 129198 : MICHAEL BELLARDO and MARTIN BUGLISI vs. WILLIAM R. SHERMAN, DALE W. WAINE and C. MARSHALL BEALE, as they are members of the NANTUCKET BOARD OF APPEALS and KENNETH I. PARKER, as he is Trustee [Note 2] of UNION STREET REALTY TRUST. The plaintiffs, Michael Bellardo and Martin Buglisi, filed two separate actions pursuant to G.L. c. 40A, §17, appealing a decision of the Nantucket Planning Board (the "Board") granting three special permits in connection with a major commercial development ("MCD") project, and the Board of Appeals' (the "ZBA") grant of a variance from certain parking requirements, all for the operation of an inn with dining facilities for its guests. The plaintiffs are abutters to the new Tuckernuck Inn, a picturesque structure on well groomed grounds, and they thereby claim standing as "person [s] aggrieved" pursuant to G.L. c. 40A, §17. The plaintiffs are also, however, operators of the Elegant Dump, a "dormitory" catering to up to twenty-six student boarders who visit the island each year and make up a portion of the seasonal work force, as well as a forty-eight seat restaurant open to the public for most of the year. Their standing to appeal is therefore challenged by the defendants and discussed below. The parties stipulated post-trial that the locus was situated in the Residential Commercial District where the uses are permitted as of right. The gravamen of the plaintiffs' complaints center on the two Boards' alleged failure to require the defendant's proposed establishment to comply generally with certain local by-laws as well as an alleged failure to consider the full impact of the project. The plaintiffs' supposed injuries range from flooding due to improper drainage design, overburdening of easement areas, and noncompliance with local sewer requirements, to the proliferation of insects and rodents. Moreover, the plaintiffs argue that the Board was obliged to require paving of the travel and parking areas, with installation of catch basins as part of the drainage design, as similar projects have been so designed. Initial opposition to the Inn was wide spread in the neighborhood, but by the time the Boards approved the project, only the plaintiffs remained in opposition. Although not consolidated, the two cases were tried together on February 6, 7, and 8, and April 13, 1990 at which a stenographer was sworn to record and transcribe the testimony, and this single decision disposes of both; they are otherwise distinct. In all fifty exhibits were admitted during trial and one, Exhibit No. 51, was stipulated to and submitted post-trial, all of which are incorporated herein for the purpose of any appeal and where appropriate are considered in both actions. Five witnesses testified. Martin Buglisi, a plaintiff, testified for himself and Mr. Bellardo; Kenneth Parker, beneficiary of the Union Street Trust which owns the Inn, General Manager of the Inn and the applicant on its behalf to the two defendant Boards; Richard Earl, of Nantucket Surveyors, Inc.; James Nettles, an abutter to the Inn; Robert J. Leichter, a consulting engineer all testified for the defendants. The burden was on the defendant Trust to prove that the special permits and variance were lawfully granted, Tebo v. Board of Appeals of Shrewsbury, 22 Mass. App. Ct. 618 , 626 (1986), and they have met their burden. The defendant Boards did not actively participate in the trial. 1. The defendant, Union Street Realty Trust, Matthew S. Parker and Phyllis A. Parker, Trustees, acquired title to 60 Union Street [Note 3] (the site of the Tuckernuck Inn, and hereinafter "Locus"), from the Nantucket Center for Elder Affairs, Inc. ("NCEA") by deed dated January 31, 1985 and recorded at Nantucket Registry of Deeds (to which all recording references herein apply) at Book 224, Page 225. Exhibit No. 3. The deed refers to a plan of land entitled "Land in Nantucket surveyed for: Nantucket Center for Elder Affairs, Inc." dated June 6, 1988 and recorded at Plan Book 21, Page 68. Contained in the deed are four grants describing easements and rights of way ranging from fifteen to twenty-five feet wide, to predecessors in title to surrounding properties, to pass over land of the Inn to which title to the locus is made subject. The plaintiffs' land benefits from one of the grants more fully described below. 2. The 24,611.8 square foot locus is a peculiar configuration of two roughly diamond shaped areas (one substantially larger than the other), the larger adjoining the smaller at the latter's southern pinnacle, with a neck twenty-five feet wide and about 125 feet long abutting Union Street and adjoining the most westerly point of the southerly parcel. The neck not only provides the only frontage on a public way for the locus, but it also serves as the sole access to a public way, both for the locus and at least one other parcel. The grants of right of way include passage over portions of this twenty-five foot wide way (the "way"). The locus is shown on a plan entitled "Land in Nantucket Surveyed For: a Nanucket Center for Elder Affairs," dated June 6, 1981 by Josiah S. Barrett, recorded with Nantucket Deeds in Plan Book 21, Page 68 (Exhibit No. 4). 3. The plaintiffs acquired title to their parcel as joint tenants with right of survivorship. The parcel shares a 145 foot lot line with locus and fronts for approximately thirty feet on Union Street. Access to the plaintiffs' property is over two fifteen foot rights of way located within the northerly portion of the twenty-five foot wide neck extended and on land of the Inn which ways adjoin in a north-south manner. The northerly way extends along the 145 foot lot line shared with the Inn, of which the plaintiffs use only a small portion for access to the parking lot in the rear of the parcel for the plaintiffs' commercial establishment. (See Exhibit No. 23A, attached hereto as Exhibit "A".) On February 8, 1977 a mortgage of the plaintiffs' land was recorded in Book 157, Page 345, which describes the grants of right of way (Exhibit No. 19). [Note 4] The mortgage deed, which is evidence only of what plaintiffs granted not in what they had rights, describes the two grants of easement fifteen feet wide pertaining to use of the northerly portion of the twenty-five foot wide neck from Union Street to the far northeasterly corner of plaintiffs' parcel. The plaintiffs complain that the maintenance of a five foot wide walkway along the southerly side of the Way, overburdens the right of way; however, the walkway is without the fifteen foot easement granted plaintiffs. Accordingly, I find the plaintiffs lack standing to press the claim. In addition, the plaintiffs complain that maintenance by the Inn of a row of logs marking part of the boundary	of the fifteen foot wide way between the plaintiffs' land and along the Inn's parking area interferes with their use of the way. Mr. Parker testified that the logs were placed there to prevent vehicles exiting plaintiffs' property from using the Inn's parking area for maneuvering room; spraying gravel against	the Inn's windows which guests found objectionable. Accordingly, I find the location of the logs locating the easement on the ground are lawfully maintained so long as they do not impair the use of the parameters of the fifteen foot wide way the travel rights of the plaintiffs and those claiming under them. The logs therefore may remain to prevent further trespass on land of the Trust. 4. The uses qualify as a "transient residential facilit[y]" under the local zoning by-law, with an in-house restaurant limited to use by guests only (more commonly referred to as a bed and breakfast), both permitted as of right in the Zoning District pursuant to Section 139-9 of the Zoning By-laws of the Nantucket Town Code as of 1988. Pursuant to §139-9 (B) (4), the site qualifies as a major commercial development as the Inn is greater than 5,000 square feet of commercial area, requires more than 20 parking spaces and is a transient residential facility with more than ten rooms; any one of these characteristics being sufficient to bring the project under the provision which requires that a special permit issue even where the use is otherwise permitted of right. The by-law further designates the Planning Board as special permit granting authority for the project in chief, as well as for any other special permits required in connection therewith. The Board of Appeals retains jurisdiction over the granting of variances. Sub-section (d) generally outlines subjects appropriate for the imposition of conditions, and the power to impose conditions is stated in terms of a right reserved by the Board rather than a mandate by Town meeting requiring the imposition of such conditions. Relevant subjects include landscaping, exterior lighting, sewer and water facilities, storm drainage, surfacing and curbing of access, driveways, parking areas, sidewalks, and the like. Waivers are permitted where "in the opinion of the Planning Board, a finding is made that it is in the public interest to do so." The by-law also requires that such developments are required to maintain thirty percent open space. 5. Following the Trust's purchase of locus in 1985, Parker applied for and received a building permit from the acting building inspector and renovations commenced, the existing structures and locus generally having fallen into considerable disrepair over the years. Later the permanent building inspector, presumably a different person, issued a stop work order; the Trust filed suit in the Superior Court which enjoined the Building Inspector from enforcing the stop work order up to 5,000 square feet, the threshold for major commercial developments, pursuant to a covenant entered into by the parties. The Order was appealed and sustained by a single justice of the Appeals Court. The defendant Trust continued to improve the premises which involved levelling the driveway and parking area, loaming and grading the grounds, particularly in the rear portions of the property, gutting the interior and raising the roof line to accommodate 18 units for guests, one being a two bedroom suite, a "commercial kitchen", 24 seat restaurant for guests (originally 36 seats and intended to accommodate the public as well), and enlarging the footprint. This work gave the structure an overall facelift. In addition, the cottage on the northerly portion of the locus was enlarged and improved for private use by the Parkers as managers of the Inn. The site received two sewer permits (Exhibit Nos. 8 and 9); the first in 1985, the second in 1988 which was the result of the Planning Board approval for full operation of the Inn. The plaintiffs never appealed the issuance of these permits. An "employer dormitory" accommodating three employees is planned for the second floor of the Inn's garage. 6. In 1985 the Trust also applied for a special permit seeking relief from the Board of Appeals from the forty feet required frontage. The Board granted the special permit for twenty-five feet of frontage subject to two conditions; that improvements be limited to the 5,000 square feet of commercial space as described above and that the site be accessible to vehicular and pedestrian traffic. Although the Board's decision suggested that the frontage may have the benefit of being grandfathered [Note 5] inasmuch as the locus has been held in separate ownership since prior to the adoption of zoning in Nantucket, this issue was never pressed by the Trust; the decision was never appealed. There has been some argument in the instant case regarding encroachment of the sidewlk into the way and its overburdening of the easement. Only those easement holders with rights in this portion of the way, however, may bring that claim which they have not, and the plaintiffs lack standing in this regard. (a) No fewer than twelve (12) parking spaces shall be provided on-site at all times. (c) Any off-premises parking obtained by the applicant shall be designated as employee parking for the Tuckernuck Inn. (d) Relief from the Code's Parking requirements shall have been obtained from the Board of Appeals in a manner which provides that no fewer than twelve (12) parking spaces exist on-site at all times. In the event of noncompliance with any of the above conditions or the expiration of the term of the lease or its termination, the restaurant is to be used by guests of the Inn and any charges for meals are to be included in the lodging bill although the Inn might advertise that meals were available to guests. [Note 9] The decision further requires provision of more extensive landscaping along the lot's boundaries, approval by the Historical Districts Commission of all lighting locations and details (which later approved the building's facade), following recommendations of the Town's engineering consultants, prohibited contribution to off-site glare and bare spotlights, and prohibition of any additional building or occupancy permits absent the Planning Board's endorsement of plans referred to in the decision. There was testimony that the Inn's spotlights were not covered. 8. The Planning Board found that 32 spaces were required under the By-law but authorized the provision of eleven conforming spaces, one sub-standard and four off-site per §139-18E in conjunction with the Board of Appeals issuance of a variance. The family boat and/or trailer occupies one of the parking spaces on locus and would require relocation should the space be required. At present ample parking appears to be available. (a) The premises shall substantially conform in all respects with the provisions of the Planning Board's special permit in Case No. 1-88 and the plans referred to therein. (b) 12 parking spaces shall be provided on-site, of which one space may be substandard in length. The applicants shall supply four off-site parking spaces by lease, [Note 10] in accordance with the Planning Board decision, as a prerequisite for the operation of a restaurant upon the premises. Four off-street parking spaces shall be provided by lease so long as the restaurant upon the premises is in operation. (c) There shall be no restaurant service to the public without further relief from this Board. All restaurant service shall be limited to registered guests of the inn and their invited guests only, and shall not be used or offered to be used by members of the general public. Restaurant business shall not be solicited from the general public in any way, nor shall the restaurant be advertised as open to the general public. Only registered guests of the inn upon the premises, and their invited guests, may be served. All charges for meal service shall be included as part of the lodging bill of a guest of the inn. Nothing herein shall permit [Note 11] the soliciting or advertising of the inn as a place to stay with meal service available to its registered guests. (d) There shall be no change in uses which would require increased parking under the by-law without further relief from the Board. The final paragraph states that the variance is granted thereby "reducing the number of on-site parking spaces . . . to seven (plus one sub-standard, nonconforming space). . . . " By the evidence eleven conforming spaces and one sub-standard space, in fact, are on site. 10. The plaintiffs object to various aspects of the project which they find offensive to the use of their property; in particular drainage design. The plaintiffs' chief	grievance concerns a belief that runoff from locus is flooding the entrance to their driveway. The plaintiffs have not proved any causal relationship between injury, if any, to their premises and the approvals granted for their neighbors' Inn. The pooling of water at the entrance to the plaintiffs' property appears to be more the result of poor maintenance of the entrance by the plaintiffs than the activity taking place on locus. Moreover, despite their allegation that the Planning Board failed to adequately consider the drainage issue, the drainage design of the site was discussed at each of the six Planning Board hearings held on the application. The high water table in the area imposed design limitations which prevented the use of catch basins and leaching fields. To compensate, three inches of gravel is used as surface, instead of impervious bituminous, allowing for storage and percolation of water. The parking lot itself serves as a retention area and is sloped so as to direct water to the center of locus, yet away from parking spaces, rights of way and adjacent properties; to facilitate the direction of storm water two inch berms will be constructed. Vannasse Hangen Brustlin, Inc., consultants to the Planning Board, twice reviewed the proposal and conditionally approved it. (See Exhibit No. 25.) Several of the improvements called for (i.e., construction of berms along the site's perimeter, shallow leaching trenches) have not been installed pending the outcome of this litigation. 11. The plaintiffs objected in their testimony at trial, although not enumerated in their complaints, to several aspects of the project relating to lighting, noise from the gravel driveway, lack of screening, and limited parking at the site. The Inn is lighted with exterior door lighting, lighting along the side walk and uncovered exterior spot lights which required and received approval by the Nantucket Historic Districts Commission; the spot lights are the focus of the plaintiffs' disdain. They are directed downward and slightly away from the Inn, although not aimed at the plaintiffs' property. The area has substantially more light than when owned by the NCEA,	as is evidenced by the decrease in vandalism to which the site often fell prey prior to being renovated. As to noise from the gravel driveway, it appears the plaintiffs' tenants are as much the source of noise as any motor vehicle traveling on gravel, if not more so, as attempts to "burn rubber" by their young residents tends to spray gravel. The design as contemplated by the landscaping plan (Exhibit No. 21B) complies with the by-law and the Planning Board's decision directed that it be increased but did not specify any particular area. Only that portion of the 145 foot long lot line between the parties' properties used for the plaintiffs' access from the right of way into their property, is not screened. Finally, as to parking in the Way, the plaintiffs did produce photographs showing the car of an abutter parked along the way. Mr. Parker testified, and I so find, that the Inn does not permit parking in the way and when it does occur, the driver is asked to move his car. Moreover, it does not appear that the parking by a third party, not the defendant, was within the fifteen feet in which the plaintiffs have rights. 12. The plaintiffs also complained at trial, but not in their complaints, that the pooling of runoff from the site onto land of the plaintiffs and another adjacent property was causing the proliferation of mosquitos and rodents. Notwithstanding the fact that plaintiffs lack standing to complain of impacts on another's property (see Bradshaw v. Board of Appeals of Sudbury, 346 Mass. 558 (1946)), there was no direct evidence of any such infestation; and there was contradictory testimony by James Nettles to the effect that he had not noticed an increase in the mosquito population. There also was evidence as to another cause for the presence of rodents and no evidence that it was a result of the activities of the defendant Inn. 13. The plaintiffs further contended at trial, but not in their complaints, that the parking of vehicles by members of the Parker family at the Parker cottage at the end of the plaintiffs' right of way, overburdened the plaintiffs' easement. A photograph was introduced showing two cars parked on what was identified as a portion of the plaintiffs' right of way, of which the fee is owned by the Trust. 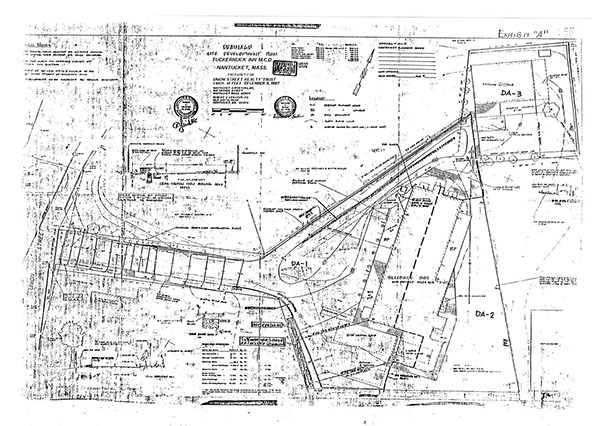 This portion was further identified as being located at the far end of the 145 foot lot line defining the right of way and ends at the far end of plaintiffs' property. Because the plaintiffs enter their parcel well before the area shown and as a practical matter cannot traverse this end of the Way in view of the barrier they have erected along the lot line, they do not use this portion of the right of way. It could be the plaintiffs have abandoned their rights in this portion of the way. However, evidence was not offered on the issue, and I make no finding as to it. At the least the parking by the Parkers in no way adversely affects the plaintiffs. 14. The plaintiffs operate the Elegant Dump, a student dormitory so-called, offering affordable housing to the seasonal student population up to twenty-six students. The plaintiffs also operate a forty-eight seat restaurant which is opened from April through November and used to be open year round. For the 1986, 1987 and 1988 seasons, the plaintiffs advertised in the local magazine Nantucket as a bed and breakfast (Exhibit Nos. 47 A, B and C). They also occasionally sought off-season business to help make it through the rest of the year, and this appears to be a decision made on an as-needed basis. As a preliminary matter, the plaintiffs' standing to raise the claim has been challenged by the defendants. Owing to the proximity of their land to locus a presumption arises that they are persons aggrieved. Waltham Motor Inn. Inc. v. LaCava, 3 Mass. App. Ct. 210 , 214-215 (1975). Once their standing is challenged, however, any evidence admitted at trial may be offered to rebut that presumption. There is no doubt that the plaintiffs are, presumptively, persons aggrieved in that they are abutters and allege direct impacts from improvement of locus. The plaintiffs, however, are direct competitors of the Inn. Both have restaurant facilities, the Inn's facility constrained only by the Board of Appeals. The plaintiffs have in the recent past advertised their establishment as a bed and breakfast which would certainly be affected by another similar establishment. It is clear plaintiffs' business stands to be affected by the availability of restaurant services to Inn guests, as well as future visitors should plaintiffs decide to operate also as a bed and breakfast as in previous years. The standard governing parties in competition was first set forth in Circle Lounge & Grille v. Board of Appeal of Boston, 324 Mass. 427 , 430 (1949), and has been consistently upheld. As stated by Justice Kass of the Appeals Court, dismissing the plaintiffs for lack of standing, "[a] party is not . . . aggrieved within the meaning of the zoning statute because the zoning relief granted may result in business competition." Redstone v. Board of Appeals of Chelmsford, 11 Mass. App. Ct. 383 (1981). See also Springfield Hotel Association, Inc. v. Alcoholic Beverages Control Commission, 338 Mass. 699 , 703 (1959) where Justice Spaulding succinctly stated, "[t]he fact that a petitioner may suffer from business competition gives him no standing." See also Baxter v. Board of Appeals of Barnstable, 29 Mass. App. Ct. 993 (1990). Even if plaintiffs had standing to pursue the matter generally, they do not have standing for two specific issues: first, as regarding use of a portion of the way to comply with the Board of Appeals 1985 requirement that pedestrian access be provided. Clearly, the walkway falls without the fifteen foot right of way in which the plaintiffs have an interest. In addition the Supreme Judicial Court has upheld the construction of a sidewalk within a way. Guillet v. Livernois, 297 Mass. 337 (1937). Second, the plaintiffs allege some impacts on an abutter common to both the plaintiffs and the Inn, the Andrews; the plaintiffs do not have standing to raise those claims. While the plaintiffs allege that their opposition to the renovation of the Inn is grounded in the amenities of the operation and errors of law made by the defendant Boards, I find and rule that the plaintiffs lack the requisite standing to press the claims raised. However, four days were devoted to trial and considerable judicial resources have been expended in bringing the facts before the Court. The cases having been fully litigated I proceed to the merits. The footing on which the plaintiffs' claims rest is the alleged failure of both the Planning Board and the ZBA to consider ramifications from their failure to strictly adhere to the provisions of the zoning by-law. Appeals pursuant to G.L. c. 40A, §17 are heard by the Court de novo, which determines from the evidence whether the Board's decision was arbitrary, capricious, unreasonable, or based on a legally untenable ground. Humble Oil & Refining Co. v. Board of Appeals of Amherst, 360 Mass. 604 , 605 (1971). MacGibbon. supra, 356 Mass. at 639 (1970). Gulf Oil Corp. v. Board of Appeal of Framinaham, 355 Mass. 275 , 277 (1969). Here, the Planning Board granted the three special permits and the Board of Appeals granted a variance, all as detailed above. It is not clear from the complaint in Miscellaneous Case No. 128711, to which of the three special permits the appeal relates; the MCD in general, employer dormitory or authorizing off-site parking. No argument was heard as to the employer dormitory and concerns about off-site parking beyond the effect on the Nettles' property, for which no evidence was admitted, were not seriously pressed. Accordingly, the plaintiffs must be attacking the MCD in general. The plaintiffs allege in their complaint filed in Case No. 128711 that the Planning Board failed to consider certain impacts of the proposed use, and failed to enforce other aspects of the zoning by-law. In particular, the plaintiffs complain about inadequate parking facilities for both the Inn and the employer dormitory, inadequate drainage, the impact on the Nettles' premises of authorizing four parking spaces for the Inn, the inadequacy of the facility under the state building code, inadequacy of the sewage disposal system and traffic impacts due to increased intensity of use of the locus. At trial, the plaintiffs offered no evidence of traffic impacts, the Nettles property or inadequacy under the state building code or of sewage disposal. In point of fact, as to the latter two items, the site was twice the subject of permits for sewer hook-up, Exhibit Nos. 8 and 9, neither of which were appealed, and considerations of the state building code are without the jurisdiction of the Planning Board. The parking facilities were accepted as adequate in light of the variance obtained from the Board of Appeals, which is the subject of the other appeal decided here, and not challenged by the Planning Board which accepted as credible an informal parking survey/study conducted in house for the Inn (Exhibit Nos. l0A, B and C) which indicated that even at nearly full capacity, at most six guest cars were parked on the site. Finally, the plaintiffs argued at trial that the by-law governing major commercial developments requires a minimum of twenty spaces. They apparently maintain, although it was not made clear, that the variance from the Board of Appeals relates to parking requirements under the section of the zoning by-law governing parking, but does not apply to any other section under the code. This is plainly erroneous as the special permit was made contingent upon the Inn obtaining a parking variance from the Board of Appeals. The ZB having granted the variance, the planning board did not act improperly in relying on it. [t]he Planning Board shall require that plans for major commercial developments be consistent with its design guidelines adopted pursuant to §139-9B (4) (b) provided however, waivers from strict compliance with the design guidelines, may be granted when, in the opinion of the Planning Board, a finding is made that it is in the public interest to do so. The Board's "design guidelines" are Exhibit No. 44. The plaintiffs argue that the Board impermissibly waived compliance with parking requirements, screening, surfacing of travel ways, parking configuration and the like. Each is without merit; no waivers were granted. In any event, there is no mnimum as to number of parking spaces required for a major commercial development, only under the by-law generally and the Planning Board merely made approval contingent on obtaining a variance from the Board of Appeals which may have been an unnecessary precaution. Screening along the parties' common lot line is already provided by a fence which appears in the photographs to be well within the three foot to eight foot parameters of §139-l8F governing screening. As to the break at plaintiffs' driveway, it is impractical to locate screening across this space, and Mr. Buglisi testified at trial that the driveway must be kept open. As to an impermeable	surface which the plaintiffs seek, there is no provision in the by-law mandating the type of material to be used, and the installation of such a surface would appear to be unwise. As to parking configuration, several designs were attempted by Richard Earl, an expert engaged by the Inn. His final proposal maximized the number of conforming spaces with adequate maneuvering room. Much was made of the question as to possible danger to cars parked at the Inn from any necessity to back out into the rights of way. The by-law states at §139-l8F (l) (a), "[p]arking spaces other than those for single-family dwellings shall be so arranged as to not require backing of vehicles onto any public street or way." Section 139-l8F (l) (d) provides "[e]gress shall be provided so as to provide a safe and unobstructed view of traffic in each travel direction." Read together, it is evident that the intent was to ensure that vehicles would not back out into through traffic on a public way. Vehicles parked at the Tuckernuck Inn will be maneuvered within the boundaries of locus. Accordingly, these sections are not violated by the parking design approved. The plaintiffs also argue that the Board's decision was not final in that certain conditions stated in the decision contemplate further review subsequent to modifications called for by the conditions. As with other factors complained of, this was not raised by the complaint, nor was any evidence other than the decision itself offered at trial. Nonetheless, the claim still does not withstand scrutiny. Conditions require, in part, additional landscaping in terms such as "balanced mixture" of species and "dense" landscaping; a "chart" locating rooms, restaurant seating and the nature of all housing is required; modification of plans to conform with recommendations of Vannasse Hangen Brustlin, Inc., and no "further" building or occupancy permits will be issued until the plans have been endorsed. Such conditions are directory and do not require further substantive review by the Board. "The distinction . . . is between a condition which contemplates a further determination of substance by the [planning board] and a condition which is simply vague." Planning Board of Falmouth v. Board of Appeals of Falmouth, 5 Mass. App. Ct. 324 (1977). While the conditions may be imperfectly drawn, they do not require "further determination of substance by the board or otherwise [prevent] the decision from taking immediate effect. (citations omitted)" Shalbey v. Board of Appeal of Norwood, 6 Mass. App. Ct. 521 , 528 (1978). The decision of the Planning Board is final. Finally, the plaintiffs argue that the Trust failed to show that the project is "in harmony with the general purpose and intent of the Nantucket Zoning By-law, and that this special permit will not result in a substantial detriment to the neighborhood." The Planning Board expressly found at page 6 of the decision (Exhibit No. 5) that the application as modified was "in harmony with the general purpose and intent of the Zoning Code". Moreover, G.L. c. 40A, §9 requires only that the use be "in harmony with the general purpose and intent" of the zoning by-law; the local by-law essentially tracks that language. No words of "detriment" as argued by the plaintiffs appear in either; instead, c. 40A, §10 governing variances contains this requirement. In any event, "this is not an application for a variance under [c. 40A, §10] which imposes more stringent statutory limitations. Lawrence v. Board of Appeals of Lynn, 336 Mass. 87 , 89-90. Rather, it was an application for a special permit for an exception permitted under the by-law, and the specific statutory conditions applicable to variances need not be satisfied. Todd v. Board of Appeals of Yarmouth, 337 Mass. 162 , 168." A variance may be granted where the Board of Appeals "specifically finds that owing to circumstances relating to the soil conditions, shape or topography of such land . . . and especially affecting such land . . . but not affecting generally the zoning district in which it is located, a literal enforcement of the provisions of the . . . by-law would involve substantial hardship, financial or otherwise . . . and that desireable relief may be granted without substantial detriment to the public good and without nullifying or substantially derogating from the intent or purpose of such . . . by-law." G.L. c. 40A, §10. Here, the Board of Appeals granted a variance from the parking required pursuant to §139-18 of the by-law. There was testimony to the effect that locus is of a peculiar shape exacerbated by the location of the long standing structure on the lot; in fact, an examination of the assessor's plan which is Exhibit No. 12, showing the general area bears this out. The configuration of the locus does not appear to have been the result of conveyances by predecessors in title of the Trust in the recent past. Moreover, because of the lot's shape and the location of the structure thereon, the Trust would suffer hardship if the parking requirements were applied literally and unnecessarily as to the use contemplated by the Trust; any use consistent with the history of the premises would require a variance. These unusual conditions make the grant of the variance fall within the ZBA's statutory authority. Accordingly, the Board of Appeals was warranted in granting the variance. In summary therefore I find and rule that the plaintiffs lack standing to attack the decisions of the Planning Board and the Zoning Board of Appeals and accordingly I dismiss each appeal. Nonetheless, having heard all the evidence, I find and rule that the Tuckernuck Inn, a Major Commercial Development, as defined by the Nantucket Zoning By-law, will enhance the neighborhood in which it is located and that the decision of the Planning Board is in accordance with law and neither arbitrary, unreasonable or capricious, and that based thereon the decision of the ZBA does not violate the provisions of G.L. c. 40A, §10. [Note 1] Kenneth Parker is a beneficiary of the Trust; his wife Phyllis A. Parker, and son, Matthew S. Parker are trustees. [Note 3] Also known as 8 Salt Marsh Way. [Note 4] The plaintiffs did not offer in evidence the deed into them, nor any deed in their chain of title which contains the grants of easement. The rights of the plaintiffs in the way cannot be definitively decided here. [Note 5] Whether locus enjoyed any other grandfathered status was not raised. [Note 6] The Planning board's Decision, which is Exhibit 5, states that this is the second application for this site and proposed use, the first having been filed in 1986 and later withdrawn prior to the Board taking final action. [Note 7] In addition to the two bedroom suite on the third floor, the employer dormitory will accommodate three employees as affordable housing. [Note 8] See Exhibit No. 11, the lease between the Parkers and immediate abutters, the Nettles. [Note 9] Cf. Exhibit No. 51, the Board of Appeals Decision at p. 5, regarding advertising. In addition, the ZBA decision expressly prohibits opening the restaurant to the public absent further relief from that board. [Note 10] Section 139-18C of the zoning bylaw requires that off-street parking be located on the parcel the spaces serve, except where "practical difficulties prevent their establishment upon the same lot, the Board of Appeals may, by special permit, allow the use of off-site premises to meet all or a portion of the required off­street parking by lease. . . ." The Parkers and third parties entered into a lease agreement (Exhibit No. 11) for the parking spaces, which the planning board designated as for employees only. [Note 11] Cf. The Complaint filed in Misc Case No. 129198, Exhibit "A" at paragraph 9(c) thereof provides, "Nothing herein shall permit the soliciting of business . . ." with "permit" crossed out, and "prevent" written above it with illegible initials appearing in the margin. Moreover, this sentence appears substantially verbatim in the Planning Board decision, except that decision does "not prevent" advertising. [Note 12] If the Board's decision is not final, the application may have the benefit of an unintentional constructive approval. See Planning Board of Falmouth v. Board of Appeals of Falmouth, 5 Mass. App. Ct. 324 , 327, n. 2 (1977).